This post was written for inclusion in the monthly Carnival of Natural Parenting hosted by Hobo Mama and Code Name: Mama. This month our participants have shared how relatives help or hinder their parenting. Please read to the end to find a list of links to the other carnival participants. This month's Carnival of Natural Parenting touches on the topic of parenting either with or without extended family. I am joining in the blog hop this time as I want to share my 2 cents worth of the pros and cons of parenting with extended family. PROS aka The Good Part! 1. An extra helping hand! With 2 kids, I can seriously say I do need an extra hand from time to time to help just watch over one of my kid for even a few minutes. As my 1st child is 38 months old now, I can trust leaving him on his own to play with his Lego or MegaBloks or just switched on the TV for a while so I could catch up with some paperwork (I help out on the admin side of hubby's business and there are times I need to prepare quotation, invoice, PO, accounting and even filing for tax submission) but I can't do that for my 8 months old girl yet. So, when my MIL is around, I will chuck my daughter or my son (if my girl is asleep) and asked my MIL to take care of them for a while. And believe me, often I will get my MIL to take care of my daughter when I really really have to go to the toilet! But then again, I can't always rely on my MIL as she has sleeping problems... she sleeps at 6-7am and wakes up at 12-1pm and there are times when she goes for her outing and I don't have extra set of helping hands. Oh well, these are the times when I will just have to let my child (especially my girl) wails while I finish up my tasks ASAP! CONS aka The Sucky Part! You know how often grandparents tend to spoil their grandchildren? Yeah... and somehow my kids (especially my boy) are good in knowing where and who to go to when they get into trouble. Who else but grandma! This is bad when we are trying to discipline our child and then you see my MIL rushing in to defend and protect our child. When situations like this arise, we will tell MIL nicely and firmly to stay out of this as it is important for us to discipline him now rather than ignoring it and let the world discipline him next time when he's grown up! Yes, grandparents can be a bad influence to our children. Many times we caught MIL giving Ben sugary snacks and even soft drinks and it takes A LOT of repeating and arguments to get the message across to her. Sigh, and with child number 2 now, I have twice caught my MIL feeding her crackers, despite telling her not to give her those foods. So what about you? Do you parent with or without extended family? Product Review - VW Family Vinyl Walls StickerSharing my review of the "VW Family Vinyl Walls Sticker"!Book Review - The Christian Parenting HandbookSharing my review of "The Christian Parenting Handbook"!Book Review - New Old-Fashioned ParentingSharing my review on the book entitled "New Old-Fashioned Parenting"
I am currently staying with my parents-in-law, who help to take care of my baby while I go to work. I do agree with your pros and cons, especially my MIL has her own opinions in almost everything! But I do enjoy some spare time to myself, unwind or surf net or just do whatever I wanted to; while she's keeping my baby accompany.. I parent without extended family (most of the time) and when I get to parent with extended family(occasionally), things go haywire. Mostly because of the pampering and overprotective-ness from my parents whenever I try to discipline my child. But despite that, it is truly a blessing that children grow up with grandparents love and it is a bonus if they live nearby. I know and tasted the sweetness of life having grandparents around when I was a child. I always wish that Isabelle gets to enjoy that unfortunately, her grandparents (both side) live pretty far away. Currently I am living with my mom and she has been pretty good about not feeding them things I don't agree with, but it wasn't so easy at first. The others grandparents have been a lot worse. My oldest daughter is very good at going to her grandma whenever she gets in trouble and my mom is way too lenient, and it gets frustrating. You just gotta stand your ground though, and I'm glad you shared how you speak to Grandma about that, I have to reinforce to myself that it is worth it to just confront them and ask for respect of those parenting barriers. I can't imagine living with either of our parents, although if we were more compatible, I think it would be a great arrangement. I'm sure your littles will be so happy to have had a good relationship with their grandma! I imagine it must be tough living with a parent... but it sounds like it has some nice pros to it as well. I don't live with my parents or PIL and am fortunate that they have a hands-off approach when it comes to the kids. 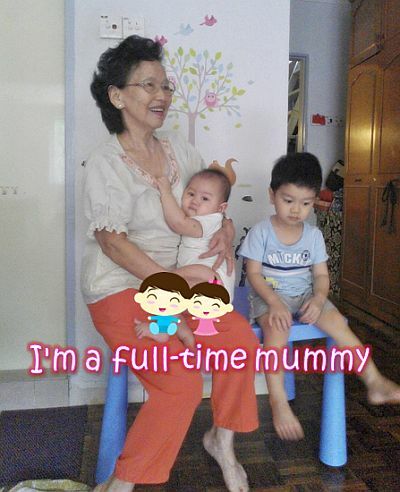 I know too well from my friends on how they can hamper discipline of their grandkids. That's really cool that you can live with your MIL. I'm glad you and your kids can share that time with her. However, I can totally understand your downsides! Our parents also like to choose things for our kids that we'd rather they didn't. Sometimes we have to let them try it out just so they'll see it's not a great idea! We'll be living with my parents for the next 4 months while we build a house. I totally see spoiling becoming an issue My parents just love to dote on my daughter. I'll definitely need to keep an eye things! The helping hands and love of grandparents and great-grandparents is such a blessing for us that we try to work through the downsides as best we can. It may never be a perfect balance but we try to make it through - you do well in living with your family though...I would find it near impossible to do that! Yes, it's not always easy to get a relative's co-operation (such as with not feeding little ones sugary consumables) without making them feel unappreciated. When one of the visiting grandfathers of my baby made a porridge (to help me out) he added loads of sugar (it tasted like glucose syrup). That was the last time I 'asked' him for help preparing her meals! My youngest is 12 so my situation is a bit different. My brother lives with us and is always more than happy to take my daughter to the park down the street when I could use a little peace and quiet. He is the go-to guy when she wants to go outside and play soccer. He is also the guy who thinks apple pie is perfectly fine for breakfast since it involves fruit.